Looking for an easy way to dip your toes into cooking with shelf-stable, freeze-dried ingredients from your food storage pantry? Your search is over! Introducing the ThriveLife Chef Pack: a family-sized meal-in-a-box using both ThriveLife’s awesome selection of products and simple ingredients you already have at home. I remember the first time we ever had freeze-dried food. It was one of those “just-add-hot-water” meals that came in a bag, the kind that astronauts and hikers carry with them on trips as they’re lightweight and compact. It was just my kids and myself at home and we had some time on our hands between homeschool lessons, so we decided to break one open and try it out. I had just started work on building my food-storage pantry, some time in 2008. I was dabbling with my little food dehydrator and tentatively working with food-storage companies like Mountain House, Honeyville, and ThriveLife. But seriously—I had no idea what I was doing. Back to the just-add-water meal. One bite of that rehydrated mess swore me off of cooking with food storage ingredients for a good long while. Alas, if only I had had a tasty introduction to freeze-dried foods! Thankfully, you can have a better first-time experience with freeze dried food. And you can spare yourself the heartache and tears of looking with despair upon the boxes of MRE’s (Meals Ready to Eat) that you prematurely bought before your first taste of disappointment-in-a-bag, when you were so young, so full of hope. Even though my kids thought the meal-in-a-bag was pretty awesome (I mean, 9- and 7-year-olds are easily impressed when it comes to food), I knew that I would never be able to survive solely on those things. Not only was the flavor kind of weird, but they were also quite calorie-dense, very starchy, and not particularly nutritious. We needed to be able to make our own meals using shelf-stable ingredients, not only relying on pre-packaged food for our suppers in a worst-case scenario (although, in a worst-case scenario, any supper is a welcomed supper…nutritious or not). While I did not have this box during the early years of my prepping, it’s a great way to learn about freeze-dried foods and learning how to incorporate them into your everyday cooking. This approach, combining freeze-dried food with fresh ingredients, is a far superior choice to relying on those meals-in-a-bag and because it’s from my favorite food storage company, Thrive Life, I know the products are going to be top quality. Each Chef Pack box comes equipped with seven recipe cards and freeze-dried ingredients for you to make four family-sized entrées and three side dishes that utilize ThriveLife’s huge selection of shelf-stable foods, and some other simple ingredients you already have at home (e.g. butter, flour, salt, etc.)! Think HelloFresh, the popular step-by-step cooking subscription box, but in food-storage-friendly terms. Our favorite was the Pulled Pork Chef Pack (you must try the Pork Chile Verde), but the other two are also great options. It all depends on your taste and what you most want to try in terms of ingredients. 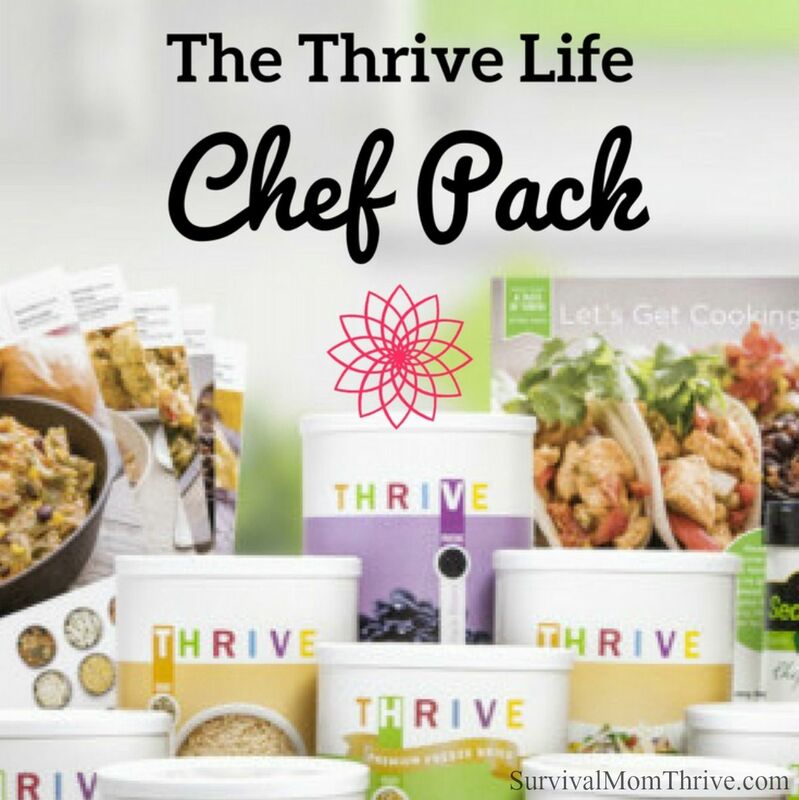 As I was getting our home, vehicles, and property ready for the onslaught of Hurricane Harvey in August 2017, little did I know that my Thrive Life Chef Packs were going to be a lifesaver during the days of heavy rainfall and subsequent massive flooding. With everything going on during the days leading up to the arrival of Harvey, I didn’t want to do much cooking, so I pulled out the Ground Beef Chef Pack and chose a recipe — Classic Shepherd’s Pie. If you’re getting ready to face a hurricane, a hot meal featuring a favorite comfort food isn’t a bad way to go! For this recipe, I used a few of the Thrive Life ingredients included in the kit — ground beef, mashed potatoes, green beans, corn — and just a few ingredients from my refrigerator and cupboards. The meal came together very quickly and it was delicious. Over next 8-10 days, we ate several meals from my Chef Packs, each one simple to make, fresh tasting, and delicious. The Chef Pack is a fantastic concept for anyone new to freeze-dried food, the Thrive Life company, or someone who just wants options for easy meals. It’s also a great way to prepare for emergencies since the Thrive Life ingredients don’t have to be refrigerated. You only need a heat source, which could be a solar oven, grill, or any other type of camp stove. 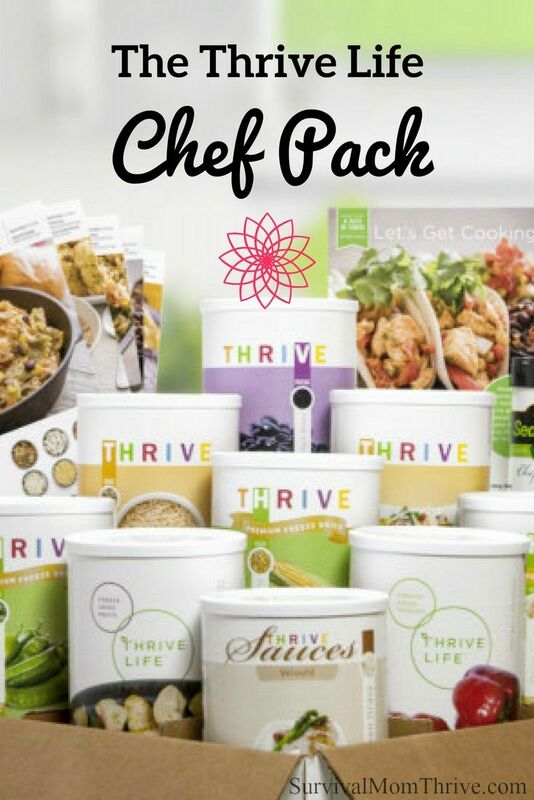 I prefer the meals from the Chef Pack over Thrive Life’s line of Simple Plate meals because they contain some fresh ingredients and therefore, taste less processed to me. I also like having smaller cans, #2.5 size, so I can incorporate the ingredients in other recipes my family and I enjoy. Costwise, each kit is $105. This brings the cost per main dish to around $22 or so and the side dishes just a few dollars each. We found that each recipe easily served 4 hungry people — 2 adults and 2 adult-size teenagers. Any of these Chef Packs are a great way to dip your toes into the world of freeze-dried food or just provide your household with a quick option for dinners on very busy nights. I highly recommend this product. In fact, my whole family gives it a 5-star rating! Thank you for this very helpful information!